I am an avid runner and have already signed up for my first 5 k post treatment. Other people’s stories. Knowing that other people have been through what I have been through has carried me throughout this journey. The breast cancer Instagram community is amazing! On good days I put in some makeup and go about my business. I focus on the good days instead of the bad. I found Hope Scarves on Instagram. I received my scarf a few weeks ago and I love it! I feel empowered when I wear it knowing that others who have traveled the same road have worn this scarf. It’s amazing to know that others have been through the same experience and come out on the other side (during treatment this is such an important reminder). I am planning on donating all my scarves when my journey is complete. I would tell them that it is an awesome experience to receive the scarf and story from other survivors in the mail. 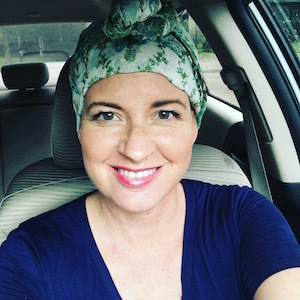 I would encourage others to reach out to Hope Scarves. To travel — this experience has taught me to live life to the fullest! I have learned to not take anything or anyone for granted. I have also learned to appreciate the special moments in life no matter how small they seem. Hope, for the win! A guide to Metastatic Cancer… ?